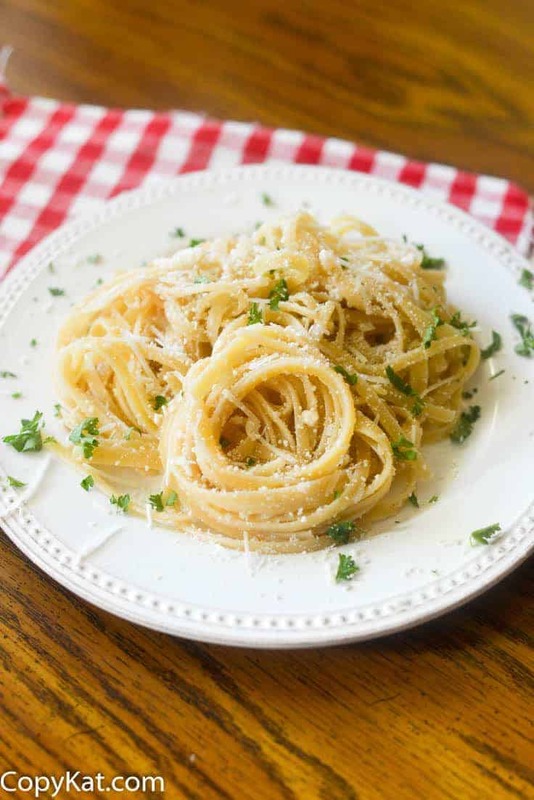 The Old Spaghetti Factory Browned Butter and Mizithra Cheese has the benefit of tasting completely decadent and being so easy to prepare. You can recreate this classic dish at home. Who doesn’t just love a dish that has a few simple easy to find ingredients in it, and it still tastes amazing? Browned butter, if you have never made it tastes so good. Browned butter has an amazing flavor. It has an intense nutty flavor. 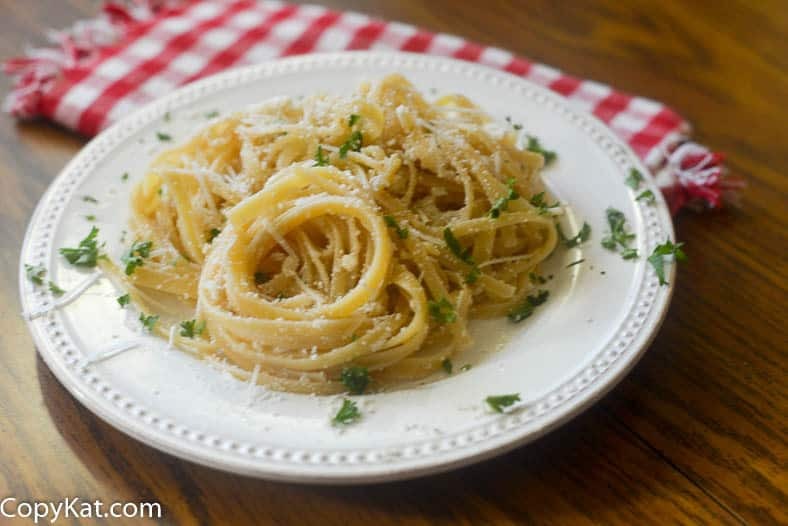 Cooked pasta and browned butter is hard to resist. If you have never been to the Old Spaghetti Factory you are missing out on a real nice treat. This dish has to be one of my favorites. I love this meatless option. I have noticed a lot of other copycat recipes online miss their specific cheese mix. They use Mizithra cheese, but they miss the Romano cheese that the Old Spaghetti Factory adds. The Old Spaghetti Factory actually sells this cheese blend in many grocery stores. If you don’t have a Sprouts near you, I can tell you how I make my own cheese blend. Mizithra cheese is a greek cheese. So you may have to go to your grocery store’s deli department. If you can’t get your hands on some Mizithra cheese you can substitute a good quality Parmesan cheese. It won’t be a copycat, but it will be quite good. If you are new to browning butter, it isn’t difficult at all. If you can clarify butter you can make browned butter. You will place the butter into a saucepan and warm it on medium heat, it will begin to froth, and you will use a spoon to spoon off the butter fats on the top of the butter. Then you will continue to cook the butter until it begins to brown. Once it turns the shade of a caramel you will have browned butter. 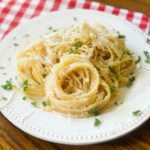 Make Old Spaghetti Factory Browned Butter and Mizithra Cheese at home with this copycat recipe. Cook the spaghetti according to package directions. Do not rinse.While the pasta is cooking brown the butter by placing into a saucepan over medium heat. As the butter melts, it will begin to foam. Remove the foam with a spoon. Cook the butter until it browns. To prepare the pasta, pour pasta into a bowl. Pour the browned butter over the pasta, and then add the two kinds of cheese. Toss pasta until it is well coated. Serve immediately. This dish does not reheat well. Which kind of Mizithra do you use? The fresh cheese or the salted and aged version? I believe I was using the salted and aged version, I have never seen this fresh. Do you have a recipe for Chick-fil-A chicken? So happy to see this recipe, simple though it is! This was one of my favorite dishes when the gang used to congregate at the Factory in college. We’d order several different “sauces” and eat buffet-style, but there was always at least one plate of this dish on the table. Thanks! It is definitely what is on the broccoli and is so yummy! It is exactly what is on the broccoli and it is so yummy! When I was doing some work there the manager told me it was goat cheese as the second cheese. He wrote it down for me and I lost it darn it. I think it was equal parts of each cheese. I was thinking this is what is on the broccoli at The Old Spaghetti Factory. Is it not? Thank you so much for this!! I live in Texas and The Spaghetti Warehouse doesn’t have this. I used to live in Cali and would get it every time I went there! Thanks again! !